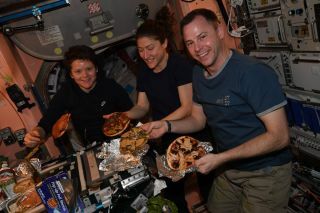 NASA astronauts Anne McClain, Christina Koch and Nick Hague show off their homemade pizza dinner on April 5, 2019. The four astronauts living on the U.S. side of the International Space Station made themselves pizza on Friday night (April 5) and shared photos of their customized dinners. "A long week of hard work and spacewalk prep calls for a pizza party," NASA astronaut Nick Hague wrote on Twitter. "Making pizza in space is similar to making pizza on Earth, the only difference is our ovens look a little different and our pizza can float!" The team has been focused on preparing for yesterday's spacewalk (April 8), conducted by NASA astronaut Anne McClain and Canadian Space Agency astronaut David Saint-Jacques, who is the first Canadian to do a spacewalk in 12 years. The pair went to work upgrading the station's robotic arm, Canadarm2, in order to to access a backup power supply, turning their suits to battery power at 7:31 a.m. EDT (1131 GMT). NASA astronaut Christina Koch displays the pizza cooking in an oven onboard the International Space Station. Yesterday's excursion is the last in a series of three spacewalks NASA had scheduled for this spring. Next, the crew onboard the orbiting laboratory will focus on unpacking the Progress 72 cargo capsule that arrived last week. Two more cargo ships launched by Northrop Grumman and SpaceX are scheduled to reach the space station later this month. For their pizza dinner, the astronauts were stocked with a range of topping options. Because the crewmembers are operating in microgravity, their pizzas technically baked sideways — but the meal still seems to have turned out to be tasty.